Paper for all Artists – Well-Made, Quick, and Easy. Cobenick Studios has moved!! Daniel is now working and teaching out of his newly renovated home studio. We’re putting the final touches on things but paper messes will be made in the spring of 2018!! Please feel free to email Daniel to be added to the announcement list in February and March. See you then! 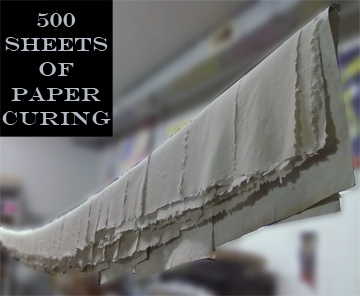 In this fun afternoon session we will introduce traditional and experimental paper making techniques. The traditional process of making paper is centered around the concept of catching and separating beaten plant fibers from a vat of water. Pulp is suspended on the surface of the water and is then strained from a vat of water by a screen stretched on a frame. Sculptural and experimental techniques will also be introduced. This workshop has one afternoon session: 1 – 4 p.m.
Meet and Greet w/ refreshments at 12:30 p.m. Date and RSVP details TBA. Workshop is limited to first 25 participants. message me or call 614 260 2021 to make your reservation. Come join Feature Papermaker Daniel Colvin in an exciting day of papermaking! Located in lovely Forest Park, Cobenick Studios is your source for fine handmade paper products and all book conservation and repair needs.